Pre-formed style, double wrapped to slide on hose before tightening. Open end style can be put around hose from side - single wrap. Used to apply punch type 3/8in. and 5/8in. 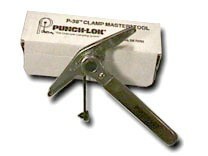 band clamps.